Baby Bronx is finally here! 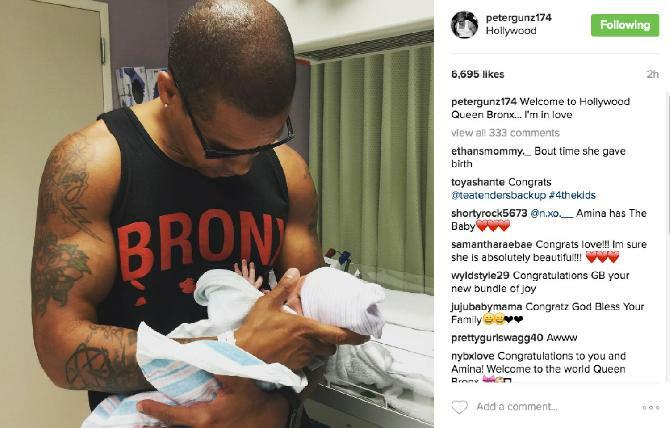 Amina Buddafly gave birth to her beautiful baby girl and Peter posted the first photo welcoming Bronx to Hollywood early this morning. Bronx arrived nearly two weeks after her due date, and we're thrilled that the wait is over! It was back in March when Amina dropped that huge bomb that left all of the Love & Hip Hop cast members with their jaws on the floor. As a very pregnant Tara sat on stage with Peter Gunz' ninth child baking in the oven, Amina very calmly announced that she was cooking child number ten. Coincidentally, it seems Amina was in labor during the Love & Hip Hop Atlanta reunion last night, so once again, even when she's not part of a reunion, she manages to create news! Congrats to the Pankeys and all of their extended family.